MIM: John Esposito, a professor at Georgetown University, has been called an apologist, but is in fact a long time activist for Islamist causes. Esposito is on the board of the Institute for Islamic Political Thought, whose director, Hamas leader Azzam Tamimi ,often states says he wants to commit a suicide bombing in Israel, and promotes terrorism. In an interview in 19976 Esposito told an interviewer that and that "terrorism, as seen in the ..., can and has been used to legitimate wanton violence and continued acts of oppression" adding that "one man's terrorist is another man's freedom fighter". Esposito also warned that Muslims should not criticise as 'unIslamic' the ruling of Sheik Tantawi of Al Azhar University which said sucide attacks on Israeli civilians were justified. Esposito made his remarks at a conference in Malaysia which he attended in the company of Holocaust denier and ex communist turned Muslim Roger Garaudy. Esposito also co authored a book with Tamimi whom he calls "my Ustadah" (esteemed teacher). The London based IIPT has it's counterpart at the IIIT in Virginia. The webmaster for both the IIIT and the IIPT is Iqbal Asaria, a known Al Qaeda operative who worked for the CDLR (The Committee for the Defense of Legitimate Rights) which was declared an Al Qaeda/Taliban entity by the US Treasury Department. John Esposito is an advisory board member of Hamas'think tank' the International Institute of Islamic Political Thought whose webmaster runs Al Qaeda website. Besides his stint as Islamist propagandist at Georgetown University, Esposito is a consultant to US Department of State who deliberately mislead the government about the threat posed by Bin Laden. A British-based Muslim radical was last night condemned by politicians and Jewish leaders after claiming he was prepared to carry out a suicide bombing in Israel. Dr Azzam Al Tamimi, 49, a prominent member of the Stop the War Coalition, said that if he could get in to the country he would blow himself up. He made the outrageous boast on BBC News 24's late night Hardtalk programme earlier this week. The academic, whose website boasts that he is regularly used by the BBC, Sky and Al-Jazeera as an Islamic expert, then claimed that he would become a suicide bomber if only he could get into Palestine. 'I cannot get in because I am not counted as a Palestinian,' he added. 'When my home town was occupied I was outside Palestine and I just wasn't counted. I'm not considered by the Palestinians as a legitimate Palestinian or by the Israelis as a legitimate Palestinian. Dr Tamimi, a member of the Muslim Association of Britain, is married with three children and lives in Willesden, North-West London. He has repeatedly spoken out in support of the terrorist group Hamas and describes their suicide bomb tactics as 'the courage of man'. He has been heavily criticised in Parliament by Labour MP Louise Ellman who said that he should be disowned by the Muslim association. In July Dr Tamimi invited the radical Sheikh Yusuf Al Qaradawi to the UK. Al Qaradawi – who spoke at a taxpayer-subsidised conference in London in July – has called for a war on Jews and the execution of homosexuals. He also condones wife-beating. Dr Tamimi lives with his family – a wife and grownup children – in a council block. He has lived in the UK for around 30 years and the Tamimis are British citizens. Neighbours described the family as 'quiet and neighbourly'. Dr Tamimi was said to be on a business trip last night. He has produced a number of academic books and papers. MIM: The 2004 interview in which Professor Azzam Tamimi, father of three, said he would like to perpetrate a suicide bombing. Apparently this ambition already expressed 2 years previously did not stop his neighbors from describing the family as 'friendly and neighborly". As far as you're concerned with Yasser Arafat, good riddance – you don't want him back in the Palestinian territories and that goes for your friends in Hamas as well? Not really. The last few weeks he spent in Ramallah his relationship with Hamas was actually improving. They were doing very good business together. For some time they have not been speaking for the Palestinians. Since they accepted Oslo and went along the path of peace-making in accordance with the terms of Israel and its supporters in America they had stopped speaking for the Palestinians. But they may have stopped speaking for you and they may have stopped speaking for Hamas but there's plenty of popularity left among the Palestinians in the territories isn't there? Well they speak for a certain segment of the Palestinians undoubtedly. This is like a tribe and Yasser Arafat was always the chief of the tribe. Exactly. So your slogan isn't exactly right is it when you say today his group no longer speaks for the Palestinians; he speaks for quite a lot of the Palestinians doesn't he? No, but you have opinion polls don't you? ... there are indications and the indications tell us that today it is Hamas that really represents what the Palestinians want. The Palestinians want freedom. Well you say that but that's not backed up by the opinion polls. The poll conducted by the Palestinian Centre for Policy & Survey Research between September 23rd and 26th gives Hamas 22% compared to, I think it's the 26% or more which is given to Fatah and the Independence. They were asked / people were asked: Will you give your vote in the next local election to candidates from Fatah, Hamas, Islamic Jihad or Independence and only 22.2% said Hamas. ... isn't much of support is it? But you just don't like the results – that's the reason you reject this isn't it? No – there are many academics and many observers who have cast doubt on these centres which are funded by the United States of America and do research that serves the peace process and those who are involved in it. Why does it serve the peace process? There hasn't been any peace process to serve, so it hasn't served anything has it ... ? ... apart from getting the opinions of Palestinians which you don't happen to like. The fact is, according to the polls, Hamas represents under a quarter of the population. That's maybe an unpalatable fact to you but that happens to be borne out by the figures. What Hamas represents today is actually what the Palestinians are hoping for. The Palestinians are hoping for freedom. The Palestinians, most of them want to go back home. The Oslo process, the peace process in which the PLO embroiled itself gave away the rights of the Palestinians. When the Palestinian human-rights group did a survey of Palestinians and asked them whether they wanted to go home, the overwhelming majority said they didn't and their offices were trashed; the offices of the Palestinian Human-Rights Monitoring Group were trashed as a result of it. So you don't seem to like any results and Hamas and Islamic Jihad and people like that don't seem to like any results that go against their own orthodoxy do they? You see that's nonsense. I as a Palestinian, I know many Palestinians around the world - I know my own family, I know my friends – we all want our homes back. Even if we live in villas, in palaces, we want our homes. Nobody has the right to steal our homes from us. Nobody has the right to bring people from outside and dump them on our land. Our land is our land. And for that, continuing violence – that's what Hamas and your friends in Hamas speaks for? Well it doesn't matter what you call it. It's still murder isn't it? But let's deal with the act. The act is murder isn't it? You can call it 'struggle' but it's murder, isn't it? No, no, no. The Vietnamese people struggled and freed themselves. The South African people struggled and freed themselves. Does it make you feel better to call it 'struggle' rather than to give it its real name of 'murder'? When you see Israeli teenagers with their blood spattered all over the ground, does it make you feel better to call that 'struggle' as opposed to 'murder'? No, but please answer my question: Does it make you feel better to call it 'struggle'? You're not defending yourself because you can't defend yourselves can you? You're not defending yourselves. These are revenge killings aren't they? We are defending ourselves. Our land is occupied. Ask the people who have occupied the land. Why are they occupying our land? How useful have your tactics been - tell me that? The rest of the world rejects the Palestinian cause and the Palestinian suffering. You don't get any sympathy from the outside world these days. What use have your tactics been to your people? At one time the Vietnamese people were rejected. At one time Nelson Mandela was called 'a terrorist'. It doesn't matter what some people say today. What matters is what you want to do, what you know your objective to be. Our objective is to become free human-beings in our land. Our land is occupied by aliens, by invaders. Well the Israelis don't want ...? The Israelis don't want to negotiate. The Israelis said they hadn't had a partner for negotiation. No – let them come and negotiate with Hamas. Why didn't they accept the truce? Why didn't they accept the truce offered to them by Hamas? Dr [T]amimi, why should they negotiate with an organisation that is dedicated to their destruction? Why? Well if they don't want to negotiate then the vicious cycle will continue. Why did Tony Blair negotiate with the IRA? Peaceful solutions at their expense? Peaceful solutions that give away Palestinian rights are not acceptable of course but if you are fighting a battlefield, if you want to stop the war you come and say: Let's negotiate, let's sit on the table. You don't impose preconditions. The problem with the Israelis is that they say the Palestinians are terrorists. If you call me 'a terrorist', you only make me angrier. No – I am a human-being. I am a victim. I have a cause. Come and sit down with me and let's discuss. We can discuss a truce and Hamas offered a unilateral truce for fifty days – [a] unilateral ceasefire that was not respected by the Israelis. What is being offered now by Hamas – a cycle of violence, continuing violence ... ? No, this is what you said. You say Hamas now enjoys the support of the Palestinians and will follow a different way from the Palestinian Authority – continuing struggle with the Israelis – that's your view? No – continuing struggle. You see you're replacing the words. It is a legitimate struggle. But you're giving it a meaning that actually takes away some of the force of what it is that you're doing and the true meaning. When you go into a marketplace, as happened on Monday – a suicide bomber and kills people indiscriminately, you call that struggle? ... in Palestinian towns and villages this would not have happened. Please answer my question. You call that 'struggle' – when a suicide bomber goes into a market and kills people indiscriminately, whether it's women or children – you call that 'struggle'? Are you murdering people today ... ? No – you are not murdering people if you are responding to attack. We were attacked in the first place. So those women and children are responsible for attacking you and you just simply fought back – people who die and have their bodies strewn over the ground? Why don't you ask the question: What are they doing there? Where did they come from? You don't like to face this unpalatable reality do you? You don't like to face the images of what your killing does in Israeli markets? And you like it? You like it? And the Israeli women and children ... ? ... they would not have been killed if their democratically elected government did not bomb the Palestinians day and night. ... that we are a victim. We are victims. You slap me on my face - what do you expect [me] to say 'thank you' to you? And who were those women and children in the Israeli market? Weren't they victims? I talked to Israelis about their violence. I'm to talking to you about that violence carried out in the name of the Palestinians. Aren't they victims as well – the Israeli women and children who are blown up by your suicide bombers? So they're the victims of their government ? Yes – who planted them on somebody else's land? Their own government blew them up? Their own government blew them up? It is logical – 100% they are the victims of those who planted them on somebody else's land. Do you want Yasser Arafat to come back? Well why not? He's a Palestinian. Every Palestinian has the right to come back. But you say Hamas is the one now who enjoys the support. Is Hamas planning to seize power from Yasser Arafat? But they've been waiting for a long time to seize power haven't they? There has been so much corruption within the Palestinian Authority and that's one of the reasons why the Palestinians have not been able to do better. How much openness and accountability would there be with Hamas? ... Hamas is a proper institution, not a tribe like some of the other factions. It would publish all its accounts would it? ... as it's been doing up til now? This is a liberation movement. This is not a company. This is not a firm. No, but you say it's going to be open and accountable. What guarantees are there of that? How so – you can be open and accountable when you're talking about others but when it applies to yourself ... ? By some of the Palestinians – under a quarter of them according to the opinion polls – but how much support do you think ... ? If Hamas joins in the leadership at the Palestinian Authority, if Hamas in future forms a government, how much support do you think Hamas is going to get from the outside world? None. While it continues to advocate suicide bombings? Are you prepared for the international community to withdraw its support totally from the Palestinian territories? The international community will have no option but to deal with and support the Palestinian leadership that is truly representative of the Palestinian people. Exactly the same – struggle, resistance, legitimate struggle. You put up the struggle - you represent the people – you achieve results. You're prepared to put that support in jeopardy just for your ideas and your slogans about struggle and continuing struggle? You're prepared to gamble with the livelihood of the Palestinian people in the Palestinian territories? Member States of the European Union have contributed the same amount. How much has the Arab world done? Who is paying the salaries of the Palestinian Authority Dr al-Tamimi? Who is paying the salaries? Who gives a damn about these salaries if they are paid to people in order to suppress the Palestinians? It's all very well for you to say. You're sitting here in a nice suit. You live in decent conditions in London. It's all very well for you to say: Oh the Palestinians can have another seven thousand years of poverty simply for my ideas. It's all very well for you to say isn't it? Well if there were a Palestinian Authority whose objective is to make life better for the Palestinians, yes you are right but if the Palestinian Authority's main objective / main function is to act on behalf of the Israelis as a police force suppressing the rest of the Palestinians who cares about such an authority? Even the Palestinians in Gaza, in Jenin and Ramallah and elsewhere don't give a damn about such an authority. They want an authority that stands up for them, that talks about their rights, that fights for their rights. Oh and Hamas has just sat by and watched the degeneration of lawful behaviour, the lawlessness, the gang warfare that's been taking place in the Palestinian territories. Hamas hasn't been contributing to that? Of course it has hasn't it? Of course it has. Well if you have evidence, put it on the table. Well who has been responsible for what the UN itself, not known as a great friend of Israel, has called the clashes and showdowns between branches of the Palestinian security forces? Hamas has nothing to do with it. Legal authority receding fast in the Gaza Strip. Hamas has nothing to do with that? Nothing whatsoever. These are power struggles within the Palestinian Authority itself which was created by Israel in order to serve Israel. Israel created the Palestinian Authority and Israel actually is destroying the Palestinian Authority. Hamas has nothing to do with it. When will the violence end? What's the aim? When will the violence stop? What are the conditions for a truce? No conditions? Just come and talk; just come and talk. Come and talk to who? ... are capable of dealing pain to you. Hamas or Islamic Jihad, to the PFLP. What - sit down with Hamas and Islamic Jihad? An organisation dedicated to their extinction – the Israelis should do that? They have to. They have no other option. When the British Government sat with the IRA and negotiated a peace agreement that's the way forward. This slogan 'we don't talk to terrorists' is nonsense. They have to. They have to talk to ... and the Palestinians are not terrorists. The Palestinians are the victims and if the Israelis want the way out they have no choice but to come and sit and talk without preconditions. And you have no preconditions? Hamas has no preconditions? When I asked one of your spokesmen, Mahmoud al-Zahar a couple of years ago in Gaza and I asked him what it would take to stop the fighting he couldn't give me a straight answer and in the end when I asked him a couple of times he said: I'm telling you frankly the attitude of Islam is not to accept a foreign state in this area. So he was ruling out the State of Israel in that area. You're telling me he was wrong? Well you can you answer that question. No – this is important; this is an important issue here Dr al-Tamimi. What would it take to stop the fighting – the end of an Israeli State? Can Israel live side by side? Has Israel the right to exist? The current violence can be stopped without having to talk about the end of Israel. No – of course not. Of course not. So what's there to talk about then? Isn't that a precondition? You see, that's blackmail. That's blackmail. Israel has no right to exist in my home, on my father's land – has no right to exist. It may exist despite me. It may exist because it is powerful, because it is supported by the Unites States of America but I will never as a Palestinian, I will never give legitimacy to a state that is created on land robbed from my father, from my grandfather and from my mother. So there are / that's your precondition then? So a truce with no progress whatsoever on any of the major issues? A truce lasting thirty years? You want them to sign their own death warrant and then you'll talk to them? ... even [if] they come and negotiate with me for instance, the Israelis, I will still say it to their faces: Your entity is an illegitimate entity. It was created through theft and robbery on my land but if you want this vicious cycle of killing to stop now for a while it can be done but if the Israelis are counting on an absolute recognition of their legitimacy that they will get from no-one. So ask your friends in Hamas to send a message, a public message to the rest of the world saying: We are ready for talks. When? When? When did they last say it? When did they last say it? When did they last say it? Dr Azzam al-Tamimi, when did they last say it? No – you tell me / you bring me an Israeli who is interested in talking. And meanwhile you advocate the suicide bombing. You said on an internet chat forum early in 2003: 'For us Moslems martyrdom is not the end of things but the beginning of the most wonderful of things'. If it's so wonderful to go and blow yourself up in a public place in Israel why don't you do it? No, please answer my question. It was a serious question. Are you prepared to do this or not? I am prepared, of course. You would [go] and blow yourself up? ... you advocate other people to do it? No – please come back to my question. Please come back to my question. Why if it is so glorious and honourable to do this, why don't you do it? When? If I can go to Palestine and sacrifice myself I would do it. Why not? I cannot go to Palestine. I cannot go to Palestine. You simply can't get in? No, I cannot get in. I cannot get in because I am not counted as a Pales[tinian]. When my home town was occupied I was outside Palestine and I just wasn't counted. I'm not considered by the Palestinians as a legitimate Palestinian / by the Israelis as a legitimate Palestinian. So as much as they don't recognise me I don't recognise them. So this is the reason - the only thing that is holding you back from strapping on a suicide belt is the fact that you can't get back to the Palestinian territories? You see sacrificing myself for Palestine is a noble cause. It is the straight way to pleasing my G0d and I would do it if I had the opportunity. Not according to Grand Sheikh Mohamed Said Tantawi of the al-Azzar Mosque in Cairo. He says groups that carry out suicide bombings are 'the enemies of Islam'. He was speaking last July at the World Conference of Islamic Scholars. What about former Prime Minister of Malaysia, Mahatir Mohamed: 'Our salvation will not be achieved by blindly killing innocent people, rather we should plan and execute a long-term development plan to excel in all fields'?. Why don't you advocate that - a long-term development plan to excel in all fields' – wouldn't that be better? And you want to take even the life that they have with a suicide belt? I don't. I don't ... You see nobody needs to tell the Palestinians what to do. The Palestinians are putting up this struggle because they are being pushed and pulled and kicked day and night. Alright. Azzam al-Tamimi it was good to have you on the programme. Place of Birth: Hebron, Palestine. Marital Status: Married with three children, a girl and two boys. 1.Ph.D. in Political Theory (1998), University of Westminster, London. Title: Islam and Transition to Democracy in the Middle East: Prospects and Obstacles. 2. BSc. in Combined Studies in Science (1979), University of Sunderland, U.K. Most regions of the Muslim World were subjected during the past two centuries to campaigns of Westernisation and secularisation that hardly spared a single aspect of life. By the middle of the 20th century, much of the Muslim World had already witnessed the emergence of entities whose regimes sought to emulate the nation-state model in the Western experience, a model that separated state from church. The emulation led to the emergence of Muslim models that separated tradition from modernity, authenticity from innovation and past from present. However, modern Muslim regimes were decidedly lopsided and selective in their espousal of the Western norm. They excluded from the Western model the adoption of democracy, a process that entailed respect for the rule of law and for civil liberties and citizen rights. The lamentable outcome of this expedient borrowing has been the reinforcement of despotism and the violation of basic human rights. As a reaction to these developments, Muslim societies witnessed the emergence of a variety of reform and revival movements that claimed to emanate from Islamic values and history and to struggle for the protection of authentic turath from the evils of Westernisation. The models proposed by these movements have ranged from the extreme of absolute rejection of the other to the extreme of total espousal of the Western civilisation. Within these extremes, one may identify what may be described as moderate trends that claim to pursue the middle position of seeking revival through an usual-based ijtihad while keeping an open mind and showing the willingness to acquire wisdom irrespective of its source. Regrettably, such trends, like other non-governmental initiatives, have not enjoyed the freedom they require. They have been restricted and combated and have in many cases been aborted. Notwithstanding such pressures, they have made significant contributions and their impact is undeniable. Due to the lack of resources, and by virtue of the monopoly of both the media and academia by the more resourceful and more influential government-sponsored secular trends, the work produced by Islamic thinkers and researchers is frequently ignored and contested. It is widely believed within Islamic circles that modern Islamic thought has not been accorded the regard it deserves or the attention it ought to receive. Writers and researchers in the field of Islamic politics are particularly prone to encountering financial and political hurdles that deny them the opportunity to fulfill their tasks. As a contribution to the ongoing endeavour to encourage ijtihad in the field of Islamic political science and to develop a modern Islamic political theory, the Institute of Islamic Political Thought has been set up in London. The Institute is primarily concerned with monitoring the progress taking place in Islamic political thinking and with identifying the fields in which ijtihad ought to be encouraged and supported. The Institute aims to compile innovative studies in the field of Islamic politics, to establish links with prominent thinkers and scholars and to identify potential creative thinkers so as to encourage them and help them develop talents and capabilities. The Institute also aims to assess the experiences of Islamic movements and their contributions to Islamic political thought. This will include the production of an objective critique of various Islamic movements, a genre of scholarly literature that is yet to be created. Much of the work done on Islamic movement has either been done by hostile critics who show no objectivity or by affiliates who lack courage and professionalism. The Institute will aim to become a credible centre of information to which academic centres and the media would refer and resort for information and advice. MIM:The 'courses' offered by the IIPT use the classic ideological texts of the Muslim Brotherhood and Al Qaeda . The Saqifah and the nomination of the first Caliph, Abu Bakr. We say to George Bush and Tony Blair PULL THE TROOPS NOW OR ELSE YOU ARE NURTURING AND MAKING Hundred's OF BIN LADEN'S, THOUSANDS OF BIN LADEN'S, MORE BRUTAL, MORE FEARSOME, MORE SAVAGE, MORE BLOOD-THIRSTY THAN BIN LADEN WAS EVER. ..
On behalf of the Muslim Association of Britain, I say to you, YOUR PROTESTS ARE NOT IN VAIN. KEEP PROTESTING. KEEP DEMONSTRATING and salute the young school children, who took to the streets this clear message against the government who is no longer listening to the people. Esposito was at a 1997 conference together with Holocaust denier Roger Garaudy. He told an interviewer that "One man's terrorist was another man's freedom fighter". 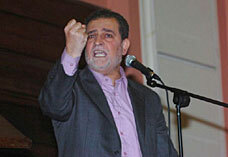 and warned against criticising Sheik Tantawi of Al Azhar University in Cairo for advocating suicide bombings against civilians. His response shocked the Malaysian interviewer. Esposito is widely interviewed or quoted in the media, including The Wall Street Journal, The New York Times, The Washington Post, CNN and network news stations, NPR, BBC, and in media throughout Europe, Asia, and the Middle East. MIM:Esposito;s bio on the CSID website. The CSID is part of a the IIIT network of 'think tanks' financed by Saudi Wahhabists many of whose members have been linked to international terrorist organisations. John L. Esposito (contact info) is University Professor as well as Professor of Religion and International Affairs and of Islamic Studies at Georgetown University. Previously, he was Loyola Professor of Middle East Studies and Director of the Center for International Studies at the College of the Holy Cross. Founding Director of Georgetown's Center for Muslim-Christian Understanding: History and International Affairs in the Walsh School of Foreign Service, he has served as President of the Middle East Studies Association of North America and of the American Council for the Study of Islamic Societies as well as a consultant to governments, multinational corporations, and the media worldwide. Esposito is Editor-in-Chief of The Oxford Encyclopedia of the Modern Islamic World, The Oxford History of Islam, The Oxford Dictionary of Islam and Oxford's The Islamic World: Past and Present. His more than 30 books include: Unholy War: Terror in the Name of Islam, What Everyone Needs to Know About Islam, The Islamic Threat: Myth or Reality?, Turkish Islam and the Secular State (with H. Yavuz), Islam and Politics, Islam: The Straight Path, Modernizing Islam (with F. Burgat), Islam and Democracy and Makers of Contemporary Islam (with John Voll), Political Islam: Radicalism, Revolution or Reform?, Iran at the Crossroads (with R.K.Ramazani), Islam, Gender and Social Change (with Yvonne Haddad), and Women in Muslim Family Law. 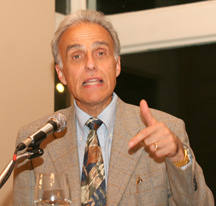 Professor John Esposito resigned from the CSID Board of Directors in October 2004. CSID thanks him for his years of service on the board, and wishes him continued success.